Jessica's favorite color is green. This is because when she was a little girl all the other children liked blue and red, and she felt sorry for green. Before we left for our trip, Tim and I happened to see a quirky movie called Happy Accidents. While the actual plot of the movie isn’t important (although it is a cute, little film), the title of the movie is something that made its way into our hearts. Happy Accidents are those, well, accidents that happen without warning or without intention, but that which bring about a better result, a happier result, than you may have even imagined possible. It’s the “if that hadn’t happened then this wouldn’t have happened and I would have missed out” sort of thing. And it’s exactly the sort of thing that happened to us in Iguazú Falls not once, but twice. Tim and I had dreamed of seeing Iguazú Falls for quite some time while we planned our trip and even while we traveled throughout the rest of Argentina. Every traveler we met during our first few months of travel would ask us excitedly, “Have you been to Iguazú Falls yet? Amazing, aren’t they?” and we couldn’t help but stare at the Iguazú Falls section of our guide book over and over again. But it was nearly three months into our trip before we got to see the total majesty of the falls, before we too experienced Iguazú. And absolutely nothing of what we read or heard prepared us for what we would witness on our first day to Argentina’s premier national park. On Tuesday, May 24th we arrived in Puerto Iguazú, an interesting little town located on the border with Brazil and Paraguay, and the gateway to all things related to the falls or cataratas. After finding lodging, food, and getting the information we needed to find the public bus that went directly to the national park, we were ready to see Iguazú. And so just after 11pm that night, we snuggled into bed with plans to visit the Argentina side of the falls early the next day. Comfy in bed, I was reviewing the Lonely Planet section on Iguazú Falls for the hundredth time, when my eyes skimmed the sentence, “On the three nights around the full moon, rangers lead tours of the falls.” I had read that sentence numerous times before, but honestly hadn’t paid much attention to it. (Given how unpredictable traveling can be, it’s hard to plan for things in advance and particularly hard when you only have one sentence to go on.) But when I read it this time, something was different. 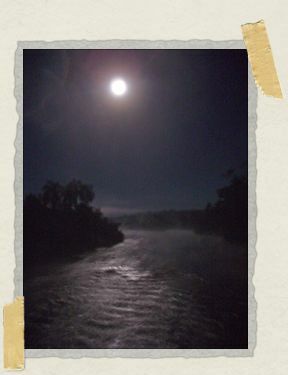 This time I recalled seeing a picture of a full moon over Iguazú Falls on the brochure that the Puerto Iguazú information office had given us earlier in the day. Yelping, I shot out of bed and grabbed the brochure, asking Tim excitedly, “Wasn’t there a full moon last night during our bus ride from Buenos Aires?” He confirmed there was and we dived into the process of finding information quickly (which, of course, only resulted in papers flying everywhere). Finally locating the picture with the title Paseos de Luna Llena, we skimmed the dates and saw that the next day, May 25th, was listed as one of the times you could walk under the full moon at Iguazú Falls. However, that was about as much information we could confirm: price, times, and other logistics weren’t mentioned at all. 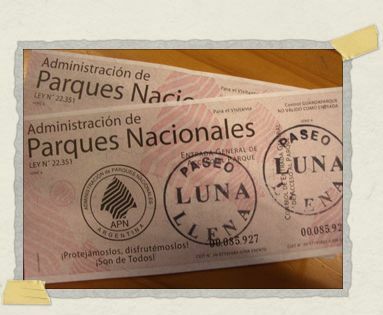 And so that’s why, if you look at the little notebook where we track all of our travel expenses, you’ll see that the last entry for May 24th made close to midnight at an internet café is: 1.80pesos internet research for Iguazú Falls Full Moon Walk. Given we went to the internet café to do some research late at night (which, I should mention, yielded less results than the brochure from the Puerto Iguazú information office) and given we were still exhausted from our 18 hour bus ride the night before from Buenos Aires, it shouldn’t surprise you that we didn’t wake-up in time to catch the first bus to the falls. (As it would turn out later, this was a happy accident in and of itself because if we had gotten up earlier, we would have ended up being at the park for nearly 16 hours instead of the 11 hours we ended up spending there that first day.) We did, however, get there by 1pm with full intentions of discovering exactly what the full moon walk entailed, how much it cost, when it started, and if would we have to leave the park (which closed at 6pm) and come back after sunset for the full moon walk. Walking into the park, I was filled with butterflies: somehow this little thing, this single sentence in the guidebook, this tiny picture in a brochure, had become one of the most important things to me. Spending one day more in Buenos Aires, not re-reading the Iguazú Falls section, or not stopping at the information office in Puerto Iguazú: if any of these things hadn’t happened, we wouldn’t have even known about the possibility of seeing the falls under a full moon. And so it didn’t seem possible that everything could have aligned itself so perfectly and then for us not to be able to go on the full moon walk. And yet I was desperately scared walking through the gates that afternoon that we wouldn’t be able to do it. And although I told myself over and over again, “If we can’t do this, then it wasn’t meant to happen,” I knew I would be heartbroken if we couldn’t. After inquiring at a few locations within the park about the full moon walk scheduled for that evening, we were finally directed to a little shop at the front of the park. And in that shop we met “The Creature,” a name that Tim decided to give the woman who worked there. Now, given I already knew “travel Spanish” when we landed in Argentina three months earlier and given I had just finished an entire month’s worth of private Spanish classes in Buenos Aires (where my professor deemed me an advanced student, go me), I feel I can say that I hold my own fairly well, with enough time and patience, in many conversations in Spanish. Therefore, since we only had the simplest of travel Spanish questions to ask about the full moon walk that evening (i.e. how much does it cost? Do we have to leave the park when it closes and return later? ), one would expect we would have discovered the answers to our questions in two minutes or less. Fifteen minutes later, we kindly smiled and left The Creature’s shop, knowing even less than when we began. Feeling defeated and more than a bit shaken from the conversation with her, we tried naming reasons why it was ok that we’d be missing out on a once in a lifetime opportunity simply because we were refused the information we needed. We didn’t get very far, of course, but the shock from the conversation with The Creature kept us distracted for a bit while we decided what part of the park we would visit first. Although we wouldn’t see the falls that night, we were determined to see them that day and have a good time while doing it too. I have to admit that while part of me realized we wouldn’t get to see the falls under the full moon that night, part of me still couldn’t comprehend that we weren’t going. And so when I saw another advertisement for the full moon walk, I went ahead and asked our questions to the park employee next to the sign. And pleasantly enough, as the overwhelming majority of our interactions with people in Argentina have always been, the employee directed us not back to The Creature’s shop, but to an information kiosk located only 100 meters away. During our walk to the information kiosk, the butterflies in my stomach were doing cartwheels, but at this point I was more determined than ever. And thus, two minutes and many smiles later, Tim and I had the answers to all of our questions from a lovely park employee. More importantly, we had purchased our tickets* to the full moon walk that evening. *This splurge made possible through the loving support of our friend Shana. (We could picture you there perfectly, a girl by the moon, and knew that you would want us to be there too.) Thank you Shana, so so much. 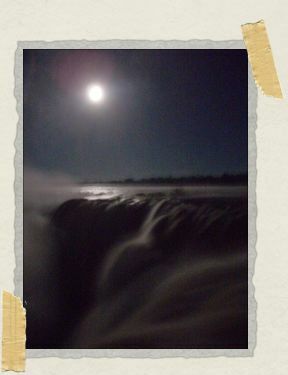 We learned that the tour would take us out to the Garganta del Diablo or The Devil’s Throat, what most consider to be the highlight of the entire Iguazú Falls experience, solely by the light of the full moon at eight o’clock. It would be a full six hours that we had to wait until the full moon walk began, but we had a national park to see and so time was no object. (And it turned out we wouldn’t have to leave the park after it closed and were able to hang-out in the park’s pizza shop until the tour began.) So after purchasing an Iguazú Falls sweatshirt for me (given the concern of the sweet lady at the information kiosk about my wearing only skirt and tank-top by the falls under the stars), we were ready. The rest of our day was positively lovely, as Tim describes here. And staring into the Garganta del Diablo was mesmerizing and overwhelming. So much so that it was difficult to imagine how it could possibly be any more powerful during the night. But, somehow, it was. At eight o’clock, Tim and I boarded the little train that runs through the national park and soon thereafter, the little train began slowly snaking through the jungle, towards The Devil’s Throat. Our seats must have been cold with the open-air train cars, but if they were, I hardly noticed. The anticipation of seeing one of the world’s seven wonders under the light of a full moon, of experiencing something that very few people experience in their lifetime, and of doing so with the person I love, had captured my imagination and made me blissfully unaware of the cold. The train conductor had suggested that all the passengers ride silently to our destination so we could hear the sounds of the jungle at night. But the anticipation of what we were all about to see was overwhelming, and chatter filled the air next to the rhythmic sound of the train. The twenty-minute ride felt like an eternity; but when we stopped, everyone was silent. Having visited The Devil’s Throat earlier in the day, Tim and I understood the importance of walking as quickly as possible to the final platform. There was limited space at the point closest to the falls and we knew there’d be plenty of time to stop and admire everything else that we passed along the way when we returned to the train. And so we skillfully worked our way past other groups who were awaiting instructions from their private tour guides and began our ten-minute walk to the final platform. The ten-minute walk involved navigating the metal catwalk that led us through jungle and over the river that creates the falls. Covered in what can only be described as a cold-humidity, the metal catwalk was slippery and made walking under the light of the moon even more of an adventure. But then again, so did the surroundings: although we were walking swiftly, it would have been impossible not to notice the utter beauty that was all around us. Gently moving tributaries and shadowed palm trees were all highlighted by the full moon above. And silence, complete and utter silence like you’ve never heard before…that is, until we reached the falls. When you near The Devil’s Throat in the day, you’re able to see a bit of it well before you reach the final platform. But when you near The Devil’s Throat in the night, you’re only able to hear its roar. And so it wasn’t until we reached the final platform that we were able to look deeply into The Devil’s Throat by the light of the moon. And it was only then, while seeing it sit pretty over the falls, that we were able to see how absolutely breathtaking the moon was too. It was at that moment when I completely understood why there are so many poems about the moon. Watching the water by the light of the moon was positively mesmerizing. During the day, the water appears to plummet swiftly and violently to a void far below. But during the night and under the moon, the water appears to float, to dance almost, twirling its fingers over and over again until it passes the edge and falls gently below. Tim and I stood there for several minutes, taking pictures, whispering into one another’s ear, and simply being in awe at the wonder before us. We remembered those cheesy paintings you see of the moon and water and a unicorn in the background, and we realized that the falls and the moon looked exactly like those paintings. We tried to describe the water, what it looked like to us, but we couldn’t think of anything tangible to compare it to, it was that unique. We felt the cool breeze come off the water, rushing past our legs and hitting our faces, and didn’t feel the slightest bit of a chill. And we told one another that this was exactly what we had dreamed about when we had imagined our trip, even though this in and of itself was completely unimaginable. We walked back to the train slowly, turning a ten-minute walk into a thirty-minute walk. We stopped at each of the tributaries in turn, simply amazed at what we had just seen and realizing it was the most powerful thing that either of us had ever experienced. And it’s hard to imagine that everyone else wasn’t feeling the same way: the train that had been so filled with excited chatter on the way to the falls, was now filled with a reflective silence coming away from them. And so while we listened to the sounds of the jungle and the sounds of the train on its tracks, we felt completely at peace and completely blessed for having such a happy accident happen to us. wow. you are so, so welcome. thank you for choosing something so fitting and incredibly moving. and… amazing. the pictures are breathtaking, and i know they hardly speak for the experience you had. *soul prickles* and a lot of love. Forgive me for sounding religious, but something tells me that this was more than just a "happy accident"… May you always remeber this moment when the dark nights of the soul creep up upon you. Sounds like a dream. I'm so happy for you both.